How to spot hail damage and how it happens. If you haven’t given our previous article on the quick steps you should take on getting the hail damage insurance claim process started, go give that article a read first! As we mentioned before, as professional roofing contractors of over 20 years we’ve seen a lot: we know exactly how devastating hail damage can be to roofs. However, not all hail damage is the same, and the extent of damage is going to be based a lot on the wind speed and the hail size during the storm. Wondering how much a roof replacement costs? 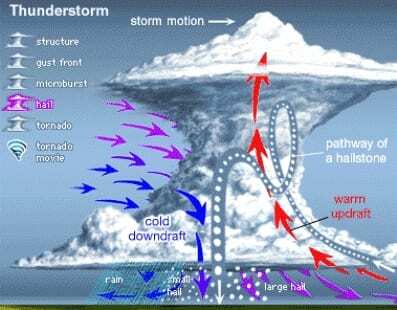 See, when a hail storm starts, the storm starts off high in the atmosphere as rain, but because of an air updraft, rather than falling to the surface like a normal rain storm, the water is carried back up into the upper level of the clouds (where temperatures are below freezing), which then causes the water droplets to freeze. Then, the frozen droplets fall, and again, are carried upwards and refrozen, again and again until finally, they weigh too much to be carried upwards and fall straight down to Earth and onto your roof, puncturing any surface along the way. The more powerful the updraft, the bigger the hail. The bigger the hail, the faster it falls. The faster it falls, the bigger damage on impact. On the other end of the spectrum that’s going to determine damage during and after the storm is the quality of your materials: lower quality materials are less durable and are going to suffer more damage than thicker, higher quality materials. Thinner, lower quality shingles will increase the odds of your roof’s decking denting, which compounds the problem and leads to a greater chance of having to replace more and more pieces of the roof until a full replacement is done. The most obvious sign of major damage from hail is black “dents” on the roof. Also referred to as bruising – sometimes they are readily obvious (for example you see a black mark or grouping of black circular marks) embedded in your shingles. Other times they aren’t quite obvious either due to the original shingle coloration or because the damage was more subtle, hurting the underlayments more than the top coating with sheer impact. Generally you’ll see many pictures of the clearer, black dents and bruises, but in many cases it’s the more subtle versions of the same kind that indicate hail damage. One of the easiest ways to spot additional damage is to look at the edges of the roof or at any areas that “protrude.” For example, check the flashing for denting, check your siding, check the ridge cap shingles, check around air conditioners – anything that has an exposed surface that’s more easily dented. Check out a full list of roofing systems here. Seeing the damage on the edges is often what helps professional roofing contractors find the more extensive damage hidden on the roof itself. When hail is accompanied by serious wind storms, then cracking is a potential risk. This is going to happen most commonly between the shingles and this is where it seems like pieces of shingle seemingly go missing or pieces that should have been connected and overlapped are gone. Cracks can, of course, be more severe depending on just how intensive the winds were (and how big the hail was). Click for more about roof repairs on our main page. 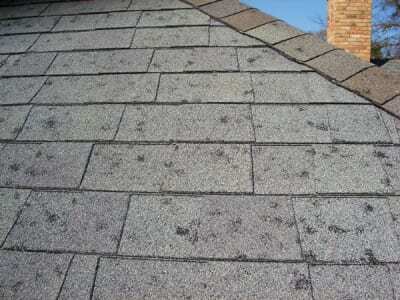 Flat roofing overall is much harder to spot damage versus asphalt shingle sloped roofs. Membrane based flat roofs (like TPO) are rarely going to show signs of damage on the visible surface, which is why major damage done to these roof types often go undetected until there’s a catastrophic failure requiring the entire system to be replaced. 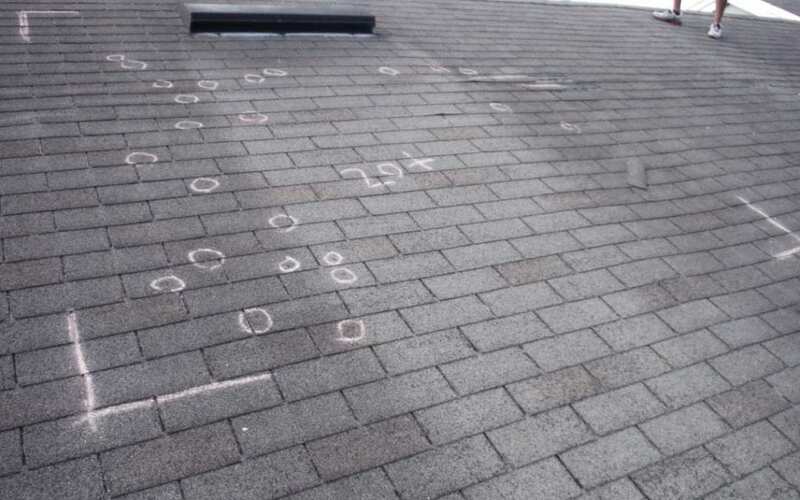 Inspecting flat roofs for significant damage definitely requires more of an expert eye to thoroughly detect where any damages are located, sources of leaks and potential future problem areas. Getting a professional inspection is usually the course of action here and often they come included in commercial roofing maintenance plans offered by roofing companies like ours. If you must inspect yourself, then check around patch jobs or prior trouble areas, look for cracks and tearing, blistering or wrinkling.